Mount Sodom is located near the southern basin of the Dead Sea in the Neve Zohar area of Israel, and it is primarily made up of salt. In the Bible, it was the location of the cities of Sodom and Gomorrah, from which Lot was forced to flee when they were destroyed by Divine power. His wife disobeyed God and was turned into a pillar of salt. 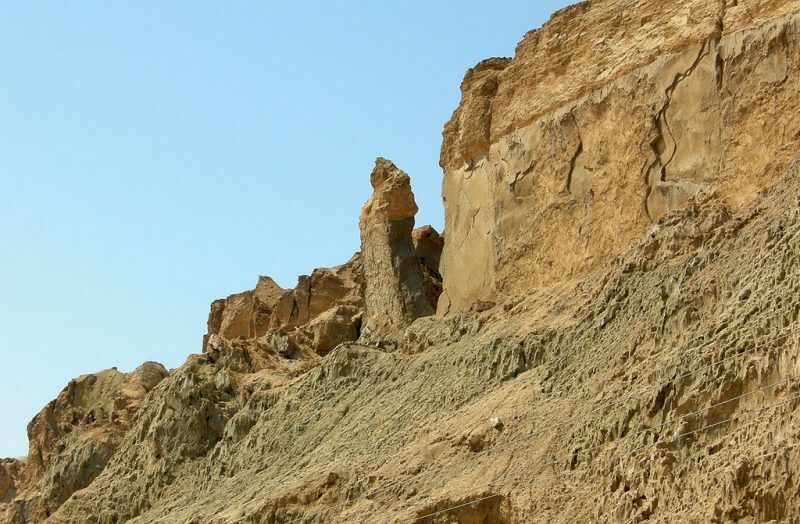 A specific salt pillar near Mount Sodom has been named “Lot’s Wife.” An Israeli research team discovered Malham Cave beneath the mountain. The cave runs for six miles, making it the longest salt cave in the world – and it is still growing. The walls, floor, and ceilings are made of salt, and water leaking in has created massive stalactites and salt crystals as well as small tunnels and crevasses. When the salt dissolves, it adds to the formation of the cave. Previously, the longest known salt cave was Qeshm Island in Iran at four miles long. Malham cave was radiocarbon tested and appears to have been around for almost seven thousand years. 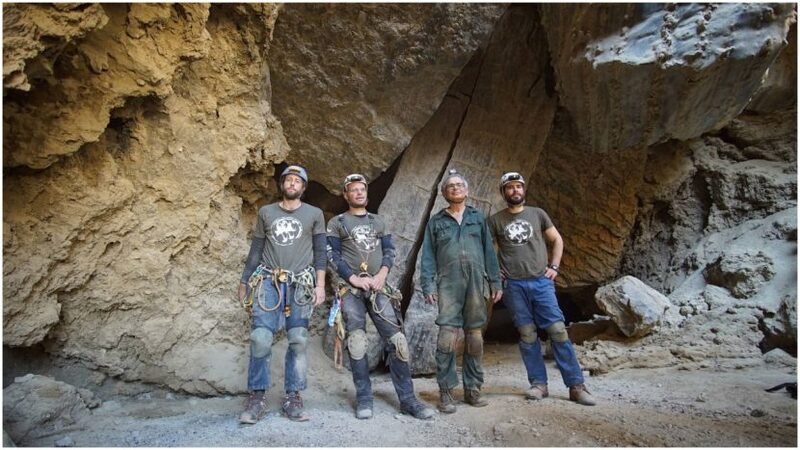 According to livescience.com, the cavers are still at work measuring the smallest crevices, and they may add more miles to the total size. Until recently, many of the previously-known caves such as the Flour Cave and the Colonel’s Cave were open to the public, but with water absorbing the salt, cave-ins are becoming more common. In the early years of World War I, one of the caves was used as a movie theater for British officers because of its natural air cooling properties. Visitors are welcome to hike the mountain, which is almost seven miles long and less than a mile above the Dead Sea. Fish fossils found in the mountain indicate that the area was once a thriving sea bed. There are numerous spas and resorts surrounding the Dead Sea, which is the lowest point on the planet. The health benefits of the mineral-rich mud and water are said to help with respiratory and skin conditions and have been used for thousands of years by Roman emperors as well as more recently by modern movie stars. 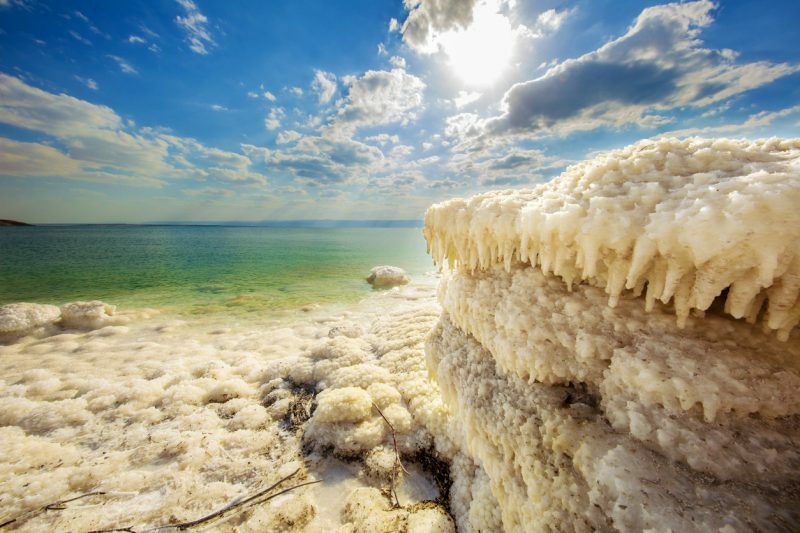 The Dead Sea stays warm all year round and the salinity content of about 34% allows anyone to float on the surface of the water with virtually no effort. The Middle East is not the only part of the world that produces salt. Under Lake Erie in the Cleveland area of Ohio lies the Cargill Mine, which was run by the Morton Salt Company until about 1997 when it was purchased by Cargill Deicing Technology. Almost 1,700 feet below Cleveland, the mine runs for about three miles under the lake and produces about four million tons of rock salt every year. Usually, much of this is spread on the streets of the states surrounding the Great Lakes in the ice and snow. 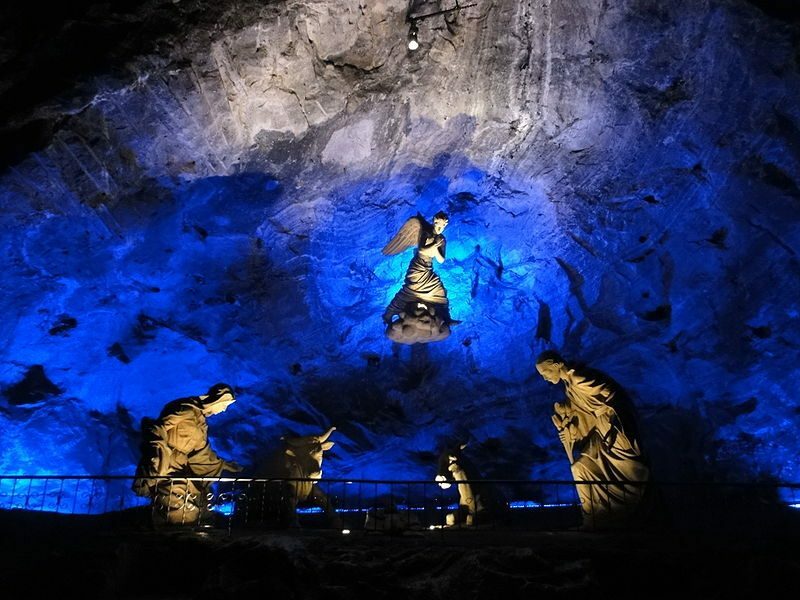 The Cathedral of Salt in Columbia is carved out of the Zipaquira salt mines, which have been in use since the 5th century BC. The Cathedral was created in 1950 but closed in 1990 because of structural problems. A new Cathedral was built in 1995 which accommodates about ten thousand people. The Asse Salt Mine in Germany produced both rock salt and potassium from about 1906 to 1965. When the mine closed due to the instability of the caverns, it became a dumping ground for radioactive barrels. About 125,000 barrels are stored there, and the concern of the salt rusting the barrels and causing radioactive waste to leak is very real. A project to remove the barrels began in 2010. The Wieliczka Salt Mine in Poland is a World Heritage Site and a National Landmark. It has become a tourist attraction since it stopped mining in 1996. According to americanmineservices.com, the salt deposits formed about 13.6 million years ago. 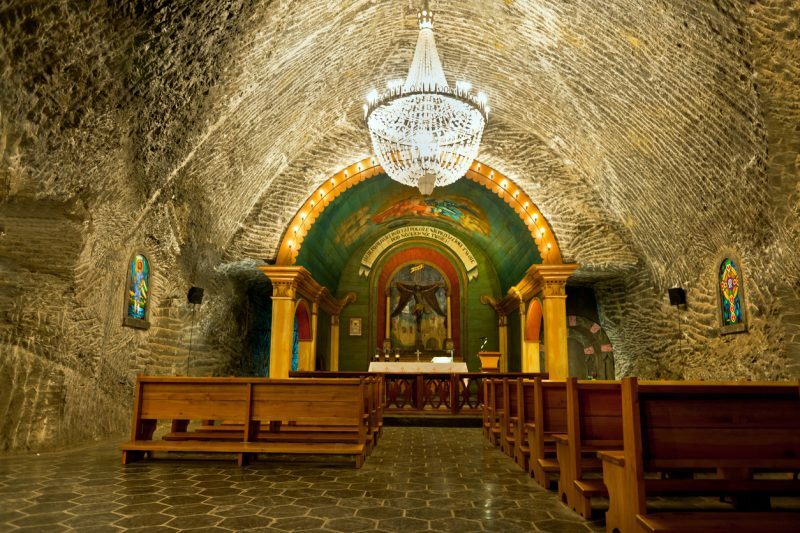 In the 12th century, a Benedictine Monastery mined the salt, and the mine stayed active for over eight hundred years. Illuminated Underground Chapel in the Salt Mine in Wieliczka, Poland. The Altaussee Salt Mine in Austria and a mine near Merkers, Germany, were two of many hiding places for Adolph Hitler’s stolen art and gold in World War II.